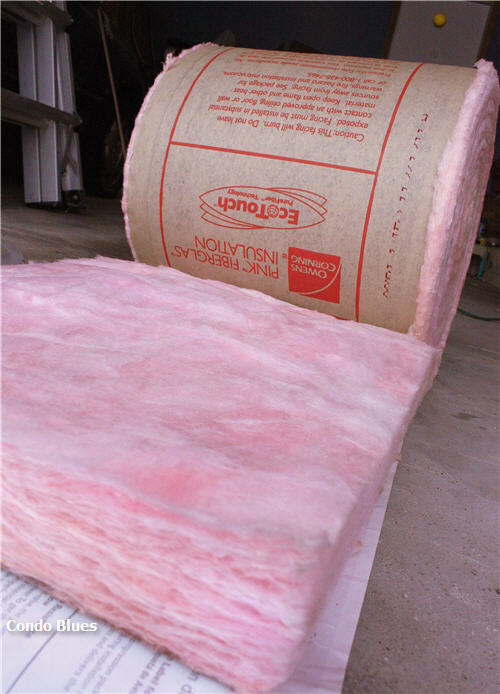 Fiberglass insulation has the reputation for being a pain in the itch to install. Fortunately, I had a better experience than I expected with fiberglass insulation when I insulated the garage door. The Owens Corning Garage Door Insulation kit I used was not made with the recycled content and no itch Owen's Corning EcoTouch insulation. The door kit insulation made my hands itch mildly when I pulled the rolls from the box without wearing gloves but nothing like the persistent itch-fest I experienced after doing minor DIY jobs involving the brand my builder used. My good experience with the fiberglass garage door insulation kit made me think differently about fiberglass insulation. 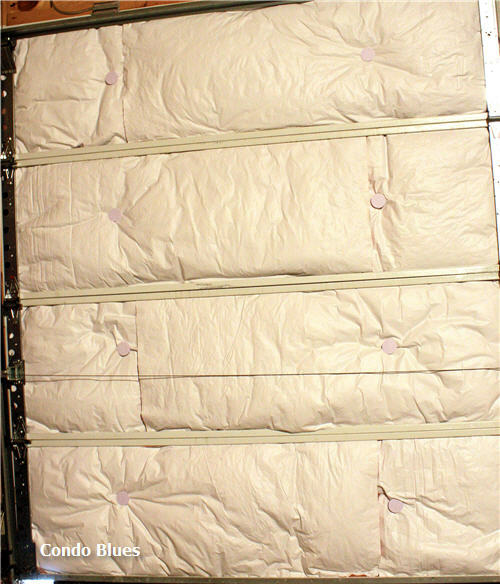 It also made me want to try the EcoTouch insulation I read about while researching garage door insulation options. I agreed to join Owen’s Corning’s EcoTouch DIY Review Panel and blog about my insulation adventures. My insulated garage door. It looks like pillows, doesn't it? 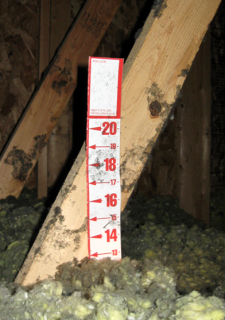 The general rule is if you can see the floor joists in your attic, your insulation probably isn’t thick enough. You should add more. Fortunately, this isn’t an issue in my attic. My attic meets code but could use more insulation for maximum energy efficiency. If you walk into my garage, it's plain to see I don’t need to take Owen's Corning Home Insulation Comfort Quiz to see if and where I should add insulation to the house. You may find the quiz helpful if you can’t see bare studs though. 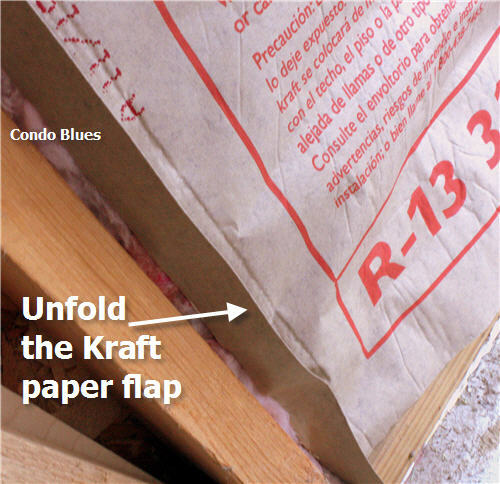 I am using insulation faced with Kraft paper as recommended for my area. I have to cover it with a flame resistant wall board like gypsum (aka drywall) to meet building code (your mileage may vary.) Husband thought the code research was overkill. I explained if my project doesn’t meet code, it could be trouble later because we can’t sell a house with known violations. 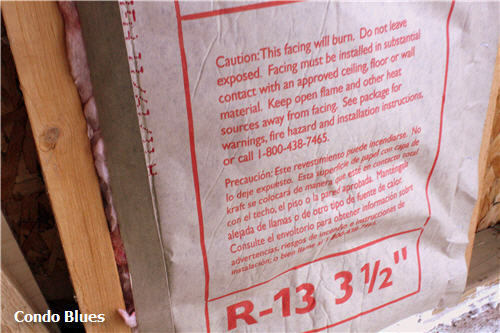 There’s also the potential of breaking our Don’t Burn Down the House rule if I don’t follow the typical insulation installation guidelines and keep the insulation three inches away from recessed lighting fixtures, metal chimneys, gas water heater flues, and other heat producing devices. Preproject research isn't overkill. It's smart. How Much Insulation Do Need to I Buy? 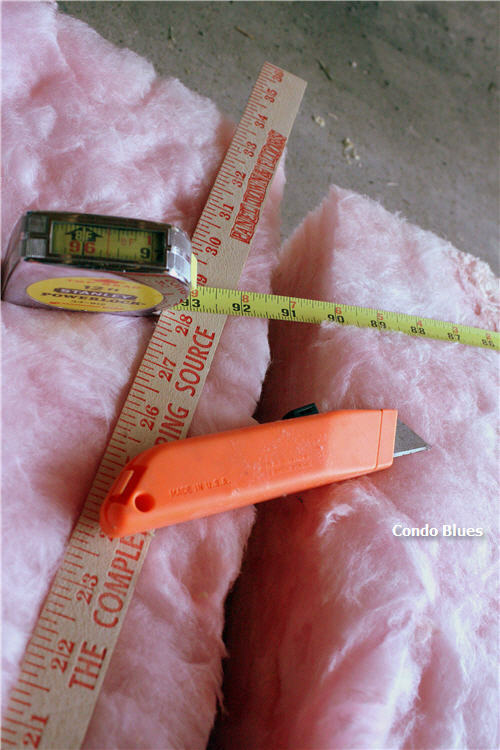 I used the Home Depot Insulation Calculator to determine how much insulation I needed to buy. It recommended I buy 9 rolls of 3 ½ inch thick R-13 insulation. 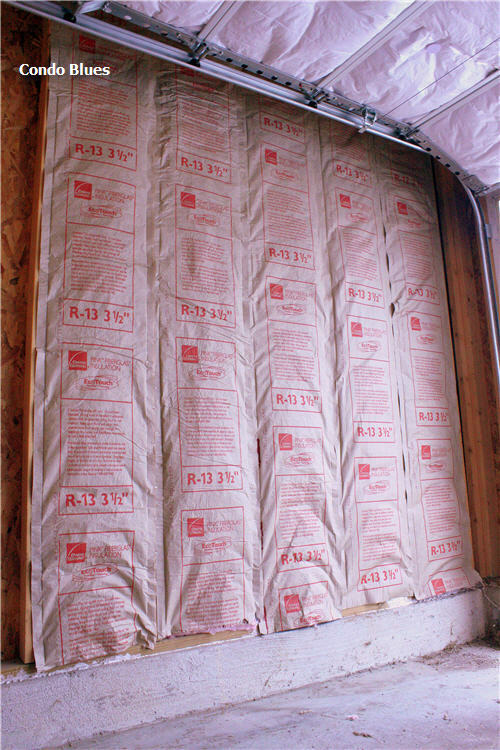 The R value indicates how well the insulation insulates. 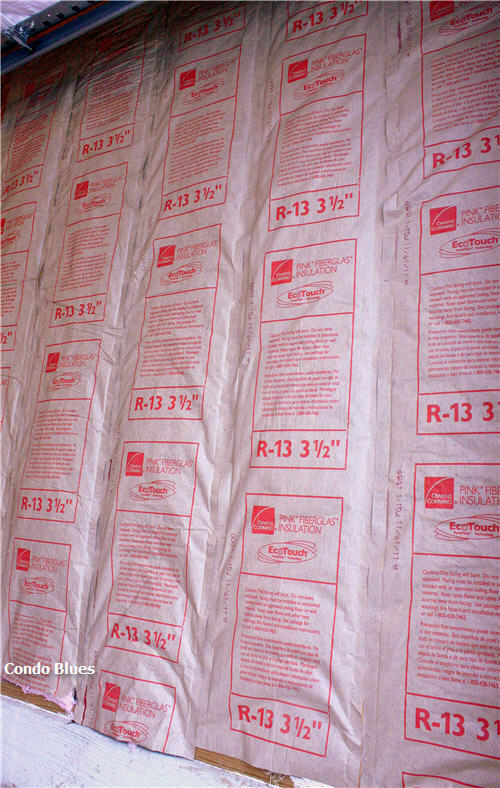 The climate and use determines the R value of the insulation you should use for your project. Installing Wall Insulation is so Freaking Easy. Why Did I Freak Out? 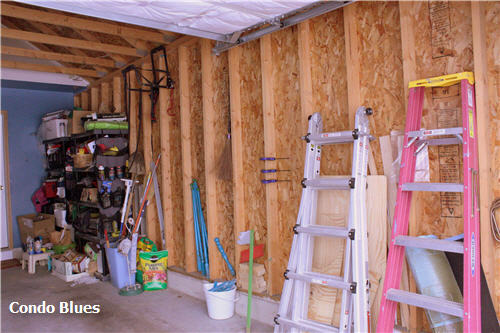 Insulating my garage walls is an amazingly simple DIY project. Seriously. If you can use a utility knife and a stapler, you can do this project. In fact, I did it as a one person project while Husband was at work. That way I didn’t have to move his car from the garage while I worked. Making the obligatory Crazy Face while holding a power tool is optional. Wearing safety glasses is not. Let's get this project rolling! I measured the insulation to fit the wall vertically. I used a yard stick as a straight edge and cut it with a utility knife. I gently pushed the insulation in between the wall studs with the Kraft paper facing out. Don't mash it in there. 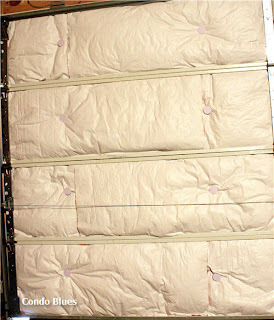 Insulation needs air around it to work properly. 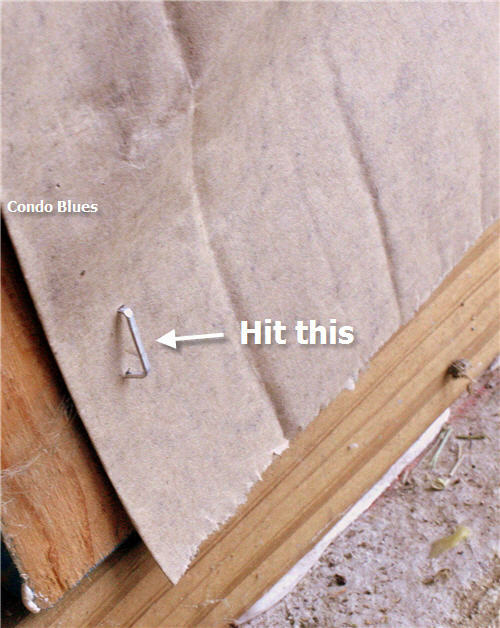 I unfolded the paper seams and used a staple gun to staple it to the stud. I switched off between a manual and an electric staple gun so I always had one staple gun loaded when the other was empty. If a staple did not staple flush I gave it a tap with a hammer. Problem solved. Projects involving hammers are cheaper than therapy! I repeated the process for the next set of studs. And the next. And the next. And the next. The nice thing about this job is the garage gets warmer as I work. How’s that for incentive? I am amazed at how easy this project was. The Kraft paper flaps lined up perfectly with the studs and made installation easy. The only difficult part of the process was the electric staple gun occasionally skipped firing a staple. The EcoTouch insulation didn’t work its way through my jeans and long sleeved shirt and make me itch like the yellow stuff I have in my house. I wouldn’t roll around on a batt of EcoTouch in shorts and a t shirt but it wasn’t awful if I accidentally touched it with bare skin. I didn’t need to wear a dust mask with EcoTouch. Good thing. I lost it in mid-project melee. The pricing isn’t outrageous as some products made from recycled materials can be and was the most affordable option between fiberglass, spray foam, and blown cellulose insulation. EcoTouch is verified formaldehyde free and Greenguard certified. EcoTouch is made with 30% recycled materials. That bottle of wine Husband and I opened to celebrate the completed project might be coming from my recycling bin to a wall near you! Owens Corning is based in Ohio. They have several plants in Ohio too. Let’s hear it for local companies! You should wear work gloves. I accidentally handled a cut bat with my bare hands after reloading a staple gun. It was uncomfortable. However, it did not feel like a hundred needles jabbing my hands as with the yellow stuff. The online buying guide was helpful but didn’t make me 100% confident that I knew what I needed to buy for my project. Fortunately, that is where the Home Depot cane in. They were helpful, knowledgeable, and just plain great. Two people would make this job go quickly because one person could measure and cut the insulation while the second person climbs the ladder and staples the insulation to the wall. Although that's more whining on my part about climbing up and down a ladder more often because I did it as a one person job. Overall, I am pleased with the Owens Corning EcoTouch. It was so scary easy to install and itch free I can’t believe I was dreading this project. This is a great project for a beginner or anyone who lacks DIY confidence. Once you finish it, you’ll rip up that Honey Do! list and start making Do It Yourself Honey! lists instead. Disclosure: Owens Corning provided a Home Depot gift card to cover the cost of this product. This did not influence my opinion as all opinions are 100% my own. Way to go, Lisa! You're really getting your garage in good shape. When is the drywall going up? The plan is to drywall in the Spring when it's warmer and less damp for the mud to dry. That could change if I get antsy and we have another warm weather streak. Wow! What a great tutorial. You did it, you really did!! Way to go Lisa! Thanks so much for linking up to the challenge! Thanks for the great info! You are one DIY diva - even with the crazy face! Thanks so much for linking to our Impossibilities Challenge! Great job, Lisa and so helpful! We have to do this to our attic and I'm so glad for the information! :) Thank you!